Various diseases are the result of a plethora of genetic and metabolic modifications that take place in cells over the course of an organism’s lifetime. These are accompanied by an increase in the incidence of errors in the regulation of gene activity, which can in turn promote the development of disease. In addition, metabolic activity alters with age and age- associated maladies. 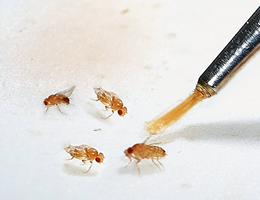 In a study carried out on the fruit fly Drosophila melanogaster, a long-established model system in genetics, a team led Dr. Shahaf Peleg at LMU‘s Biomedical Center has now shed new side effect of a commonly used epigenetic drug on metabolic activity. The group’s findings appear in the online journal Scientific Reports. Epigenetic processes essentially determine which genes in a given cell type are amenable to activation. These processes involve the attachment of certain chemical tags, such as methyl groups (CH3), at specific positions in both DNA and a class of gene regulatory proteins known as histones. In various diseases, the mechanisms that control epigenetic modifications become less discriminating. Shahaf Peleg and his colleagues have looked at the impact of the inhibition of ‘deacetylases’, enzymes that remove epigenetically attached acetyl groups (CH3COO-) from histones. Since these proteins are responsible for “packaging” of the DNA in the cell nucleus, they play a vital role in regulating the accessibility of genes. Therefore, drugs that inhibit the deacetylases have gained considerable attention and are currently being tested for use in epigenetic therapy. Peleg developed a novel method to monitor the effects of deacetylase inhibitors not only on the cellular and organelle (mitochondrial) levels, but also in whole tissues. To their surprise, their experiments revealed that inhibitors of histone deacetylases cause an acute rise in oxygen consumption in the mitochondria. In other words, these drugs create a temporary metabolic boost in the tissue. This in turn implies that these agents increase overall metabolic activity. Because the onset of the metabolic boost is so rapid, it is likely that the drugs induce it independently of any effect on histone acetylation. This is in agreement with recent data showing that many enzymes that regulate metabolic activity can be also acetylated. While it is not clear how acetylation of metabolic enzymes impact their activity, the results of the study suggest that deacetylase inhibitors may target as yet unknown proteins that regulate metabolic activity. The study therefore suggests a novel beneficial attribute of these drugs, especially in diseases which are accompanied by reduced metabolic activity. The study thus supports the notion that protein acetylation has an important role in mediating the therapeutic benefits of administering deacetylase inhibitors.